There are some science facts so ubiquitous that it takes a while to realize that, oh yes, someone actually discovered that. Anyone who went to a state park, or looked down at a freshly-sawed stump, has held their parents' hands and heard how you can tell about the life of a tree by studying its rings. Now meet the guy who discovered that. The man who kickstarted dendrochronology, or the science of using tree rings to figure out the past, was not a historian or a botanist. He wasn't even a biologist. Andrew Ellicott Douglass was an astronomer. Born in 1867 in Vermont he traveled down to Arizona for its emptiness and clear nights. He taught astronomy at the University of Arizona, and worked at the Lowell Observatory. Douglass' special obsession was the sun, and the random sunspots that traveled across is surface. He became convinced that there was a link between sunspot activity and radical changes in climate. In particular, he believed in eleven year cycles of sunspot activity and their effect on the climate of the entire Earth. Sunspots had been recorded since the fourth century BC, but accurate and accessible records of sunspots began in the 1600s. That gave him over two hundred years (and he lived to ninety-four) of records of sunspots to begin cross-referencing with world-wide weather phenomena. But where could he get evidence of world-wide weather phenomena? While some regions had good documentation, other region's had no surviving records of what the weather, or the climate, was like. He needed something that would give him reliable records of climate going back hundreds of years. His search lead him to the giant sequoia trees on the west coast. 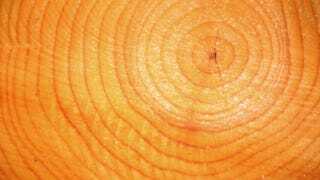 People knew that the rings of a tree trunk indicated annual growing cycles, but there hadn't been much study. Douglass changed that - using tree rings to figure out things like historical rainfall, dry spells, diseases, fires, insect activity and even the kind of particles that has been in the air at different seasons. He founded the Laboratory of Tree Ring Research, and studied thousands of samples to piece together accurate pictures of the climate that the world used to have. Douglass never proved his theory about solar flares and climate change. On the other hand, he founded a new branch of science - dendrochronology. If only everyone's failures turned out as well. Via American Scientist and Tree Ring Society.